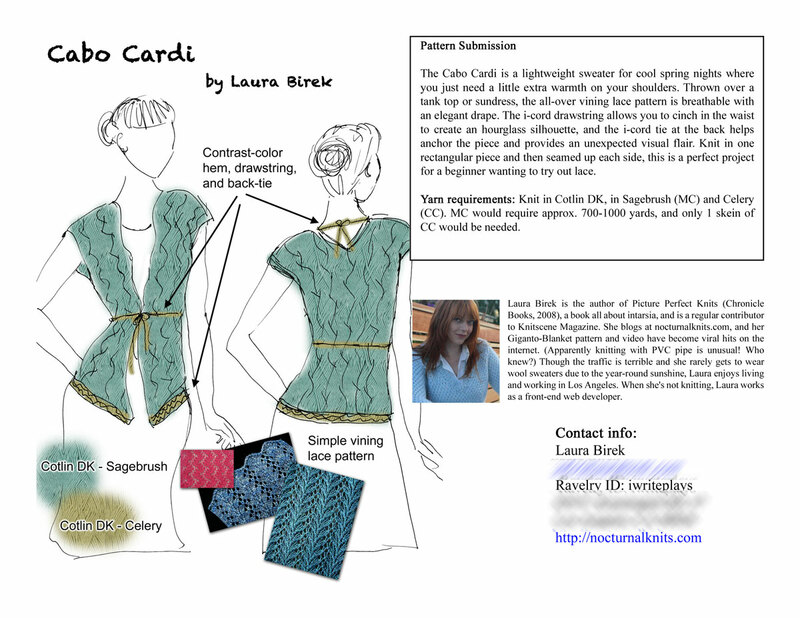 Now that my Cabo Cardi has been released in the wild, I thought it’d be fun to look back at how the pattern came into this world. Back in May 2012, I saw a call for submissions on the Ravelry Designers forum for Knit Picks’ first-ever pattern collection. (Here’s the original post.) I checked out their mood board and thought I could come up with something for them, so I started sketching. In addition to adding the colors in, I made sure to point out any important design features and include a few swatch images to show what type of stitch I’d like to use. Knit Picks requires a one-sheet submission, so the next step was to write up a little copy and put it all together on one page. So, remember, this was all the way back in May — nine months ago! I submitted my design on May 16, 2012, to be exact, and then more or less forgot about it. Then, on July 3, I got an email from Knit Picks saying my pattern had been chosen for their collection. Woohoo! The deadline to submit my finished pattern was August 15, 2012. Luckily, this collection didn’t require me to knit up my own sample, so I only had to come up with the written instructions and send it off to their test knitter. I worked on a few swatches, finally coming up with a stitch pattern I liked. That’s when I ran into the first problem with my original design: Knit Picks didn’t have enough of the Cotlin DK in Sagebrush, so they asked me to pick some new colors. I love the way it turned out, and I’m so happy to be included in the awesome Knit Picks First Light collection. Hopefully this has been interesting to y’all! I know a lot of people who’d like to design but don’t know where to start, so I thought this might be helpful information.